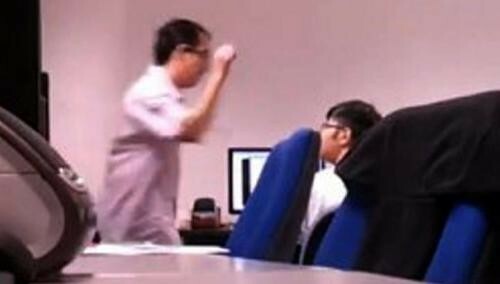 THE supervisor filmed hitting an employee around the head has been snubbed by his former colleague after offering an apology in the hope of settling the matter amicably. Mr Alan Lee, of IT software company Encore eServices, went through a friend to offer an olive branch to the alleged victim after a video of the incident was posted on YouTube. But the 29-year-old told The Straits Times last Saturday that his family does not intend to "settle" the matter with his former supervisor at the software company, and will let the authorities deal with him. He has lodged a police report and a complaint to the Ministry of Manpower. Mr Lee, who is believed to be in his 40s, tried to explain himself and apologised for his actions to the man's parents and two family members when they met at the company's Jurong East office last Monday. The graduate worked as an intern at Encore for six months before becoming a full-time employee for 2 1/2 years. He said he received a text message from a friend of his former supervisor last Friday . Known as Mr Hong, he tried to intercede on Mr Lee's behalf as the latter was "advised not to contact" the victim directly. Mr Hong asked to "seek an amicable resolution". The man and his family agreed initially to meet Mr Hong but later turned him down. The victim said: "This case is still being investigated by the police and we're waiting for the outcome of investigations. We just hope that he gets the right punishment." He added he is "still traumatised" by the incident. The alleged abuse came to light in a 17-second video which also showed the supervisor using vulgar language. It was reported that the victim, who has a degree in computer science, is keen to take up an offer from the Employment and Employability Institute, e2i, to help him look for a new job.